The picture shows casual fashion of the time. 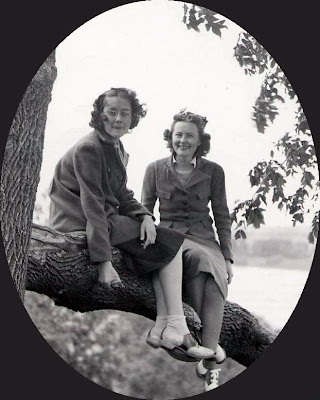 They are wearing the square shouldered jackets that were popular and though they are wearing saddle shoes and socks for a walk at the lake they are both wearing skirts. It looks cold and you can see my mom has layered a sweater over her shirt in addition to her jacket. Pants would have been warmer yet their legs are bare. It has me wondering how often women wore slacks at that time. I know they become more common after the United States entered World War II and so many women went to work manufacturing items needed for the war effort. If you looked at the large version you can see the how sharp the picture is and how artfully the tree has been retouched and the picture shaded to bring out the young women. Susana Fierro-Baig does wonderful work with pictures both old and new. Go to her site, Amazing Photo Transformations, to see more of her work.